INGLORIOUS Release Video For "Holy Water"
February 2016 saw INGLORIOUS's self-titled debut album released via Frontiers Music SRL. 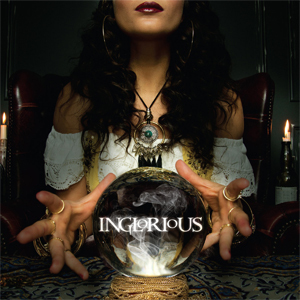 INGLORIOUS's self-titled debut album, is out now on Frontiers Music Srl. The album can be ordered on iTunes: http://radi.al/Inglorious and on Amazon: http://radi.al/IngloriousAmazon. The band has released a video for the track "Holy Water". Be one of the first to watch the video on KNAC.COM right HERE. The critical reception to INGLORIOUS has been amazing, with praise coming from the media and legendary rock stars including Brian May of QUEEN who said, "You guys really do look like a potent young DEEP PURPLE but with a new slant - very classic! And the musicianship is stunning. Good luck with it all - I'm sure you will do great. Amazing vocals, by the way." INGLORIOUS are being hailed as one of the UK's heaviest new hard rock bands to emerge from the British underground scene. Originally formed in February 2014, the band is fronted by Nathan James, who made a name for himself having sung for the multi-platinum selling TRANS-SIBERIAN ORCHESTRA, and SCORPIONS guitar legend Uli Jon Roth. Inspired by musical giants such as DEEP PURPLE, LED ZEPPELIN, WHITESNAKE, BAD COMPANY, AEROSMITH, the band's song "Breakaway" has already found its way on to UK rock radio.